Nothing beats a classic chocolate peanut butter egg in your child's Easter basket. Except when they are homemade! This homemade version of chocolate peanut butter eggs is made with minimal ingredients and, of course, with love. They are simple to make, can easily be made well in advance and frozen, and are a great treat that you can create with your kids. Just make sure to use supervision when melting the chocolate and dipping the eggs, as the chocolate can get a bit hot. For the drizzle, we used pink, purple, blue, and yellow, however, feel free to experiment with other colors as well. In a large bowl, combine the melted butter, powdered sugar, peanut butter, and graham crackers. You can use a hand mixer or you can mix thoroughly with a large spoon. For better consistency, use the hand mixer. Place the ball of peanut butter filling between two sheets of parchment paper and roll out to about 1/4-inch thick. Place the sheet of peanut butter filling on a baking sheet and place in the freezer for one hour, or until firm. Use a small egg-shaped cookie cutter to cut out your egg shapes. You can also use a circle cookie cutter and gently form the top of the circle into an egg shape. Place the egg shapes back into the freezer while you prepare the chocolate coating. In a double boiler melt the semisweet chocolate chips with the shortening, stirring constantly, until completely smooth. Using a fork, carefully dip each egg into the melted chocolate coating completely. Remove using the fork and allow the excess chocolate to drip off of the peanut butter egg. Carefully place on a sheet of wax paper and repeat with the remaining eggs. Allow them to harden completely at room temperature, about 1 to 2 hours. Lay out 3 to 4 small bowls (depending on how many colors you want). Add drops of food coloring to each bowl to create pastel purple, pink, blue, and yellow. You will only need a few drops of each color because of the small amount of chocolate and the desire to create a pastel color. Melt the white chocolate chips in a double boiler or in a microwave, stirring after every thirty seconds of heating. Divide the white chocolate between the three or four bowls. Stir them to completely blend the colors. 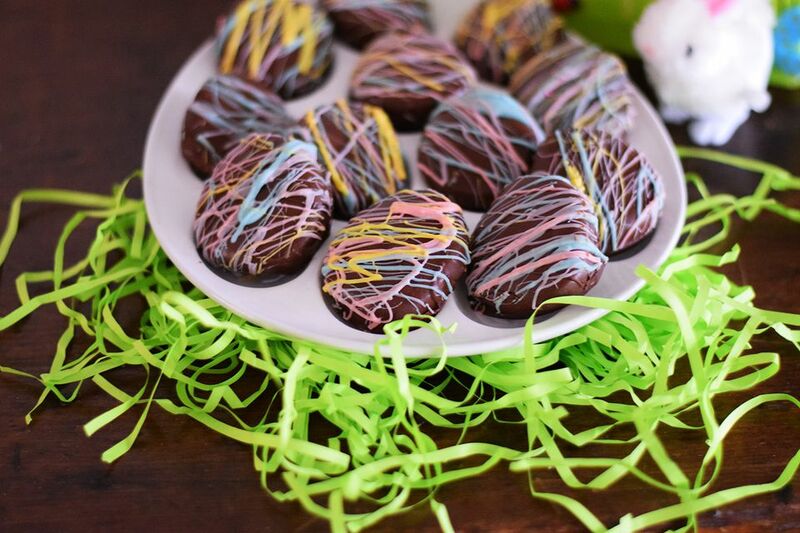 Drizzle each color over the hardened eggs. Allow to completely harden again, at room temperature, and serve! If you have any leftovers, you can store them in the freezer.